BANGI, 9 December 2014 – A successful leader must be a mentor and an agent of change in the community where his leadership skill is closely connected to his role as a visionary leader. Adjunct Professor Dato’ Sri Syed Zainal Abidin Syed Mohamed Tahir from The National University of Malaysia Graduate School of Business (UKM-GSB) said this in his public lecture on ‘Promoting Socially Responsible Business Practice in A Glocal Context’ here today. ‘Glocal’ refers to being global and local. To be successful, the entrepreneur needed to be able to generate new value creation within his organisation and willing to be responsible for the risk taken. 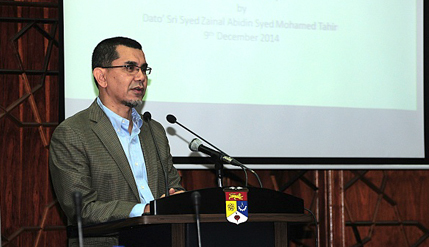 An entrepreneur must be someone who always thinks positively and be a decision-maker while having qualities that can inspire confidence in the community, as well as being committed to what he does, Prof Syed Zainal Abidin said. He said the success of an entrepreneur can be seen with improvements provided to customer service especially following an increase in competition. The programme was organised by the Centre for Professional Development and Leadership in collaboration with UKM-GSB.